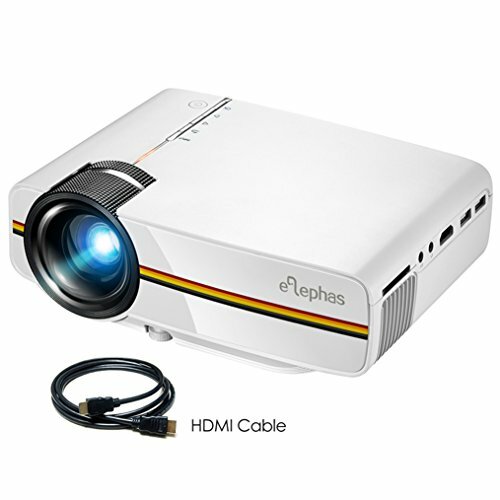 ENJOY YOUR HOME THEATER ENTERTAINMENT WITH ELEPHAS NEWEST SMART VIDEO PROJECTOR, CHRISTMAS GIFT FOR YOUR FAMILY & FRIENDS ! Moving to Large Screen from TV Elephas YG400 Video Projector provide 50~130 inches large projection size for you with better visual experience just like you are in a cinema. EXCELLENT PICTURE QUALITY ---- You can adjust the picture size from 50 ~ 130 inch ( Best for 100 inch ). Projection Distance is from 4.95 ~ 13.12 ft ( Best for 7.2 ft ). 800 x 480P Native Resolution and support up to 1080P, the contrast of 1000 : 1. STRONG CONNECTION ---- ELEPHAS YG400 Home Theater Projector enable to connect to Fire TV Stick/ Roku Streaming Stick/ Chromecast/ Laptop/ DVD/ PS3/ Xbox/ TV box via HDMI input; Connect to PC via VGA jack; Hook up to headphone/ outer speakers via Audio port; Insert U-disk/ hard disk device into USB slot. Adapters are required if you connect the projector to a Ipad, Iphone or other tablets and smartphones.